How did species evolve—gradually by “creeps” or dramatically by “jerks”? Darwin’s Origin of Species (1859) explains evolution as being smooth and occurring by steady and gradual changes in the species. This explanation of evolution by natural selection is widely accepted by evolutionary biologists, but it does not account for the sudden and unaccounted for appearance of numerous new species in the fossil record, many of whose antecedents remain to be discovered. Darwin acknowledged these gaps and partially explained them as resulting from imperfect preservation of the fossil record. But he also noted that not all species changed at the same rate and to the same extent. In 1972, the evolutionary biologists-paleontologists Niles Eldredge, at the American Museum of Natural History, and Stephen Jay Gould, at Harvard, proposed an alternative explanation of evolution—one that occurred by “jerks” that would account for the sudden debut of new fossilized species—which they called punctuated equilibrium. According to this hypothesis, most new species originated after dramatically splitting from a parent species, rather than gradually changing from the parent. During their relatively early independent existence, the branched population briefly (in geological terms) underwent its major changes in appearance. Thereafter, the new independent species, small in number, remained in an extended state of stasis (equilibrium), with only modest changes in appearance for the rest of their existence—a period that might be millions of years in duration. The foundation of punctuated equilibrium was built upon Ernst Mayr’s well-accepted theory of geographic (allopatric) speciation, popularized in 1963. In Mayr’s theory, speciation—the formation of distinct species from a parent species—occurred when a small group became physically separated and branched from the mass of the parent population over a relatively short period, a time insufficient to leave a definitive fossil record. Punctuated equilibrium is considered to be an important model of evolution, but it is highly controversial and often misunderstood in many aspects, including the mistaken notion that it is a refutation of Darwin’s theory of evolution by natural selection. SEE ALSO: Paleontology (1796), Fossil Record and Evolution (1836), Darwin’s Theory of Natural Selection (1859), Genes on Chromosomes (1910), Evolutionary Genetics (1937), Biological Species Concept and Reproductive Isolation (1942), Hybrids and Hybrid Zones (1963). 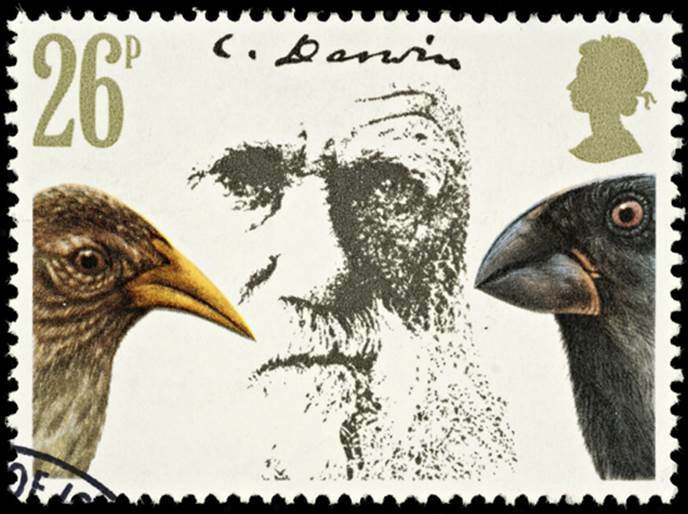 A 1981 British postage stamp depicts Charles Darwin and Galápagos Island finches with beaks of different sizes and shapes, which were a building block in his developing theory of natural selection.